First published in 1974, Social Work Treatment remains the most popular and trusted compendium of theories available to social work students and practitioners. 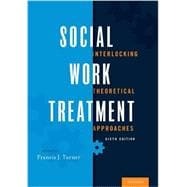 It explores the full range of theoretical approaches that drive social work treatment and knowledge development, from psychoanalysis to crisis intervention. A treasure trove of practice knowledge, the text equips professionals with a broad array of theoretical approaches, each of which shine a spotlight on a different aspect of the human condition. Emphasizing the importance of a broad-based theoretical approach to practice, it helps readers avoid the pitfalls of becoming overly identified with a narrow focus that limits their understanding of clients and their contexts. This sweeping overview of the field untangles the increasingly complex problems, ideologies, and value sets that define contemporary social work practice. The result is an essential A-to-Z reference that charts the full range of theoretical approaches available to social workers, regardless of their setting or specialty.